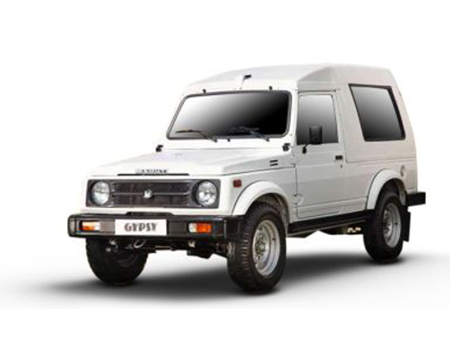 Gypsy is an SUV car which was launched way back in the year 1985 when the term SUV was not known to the majority. It has been used for tough military purposes and has great off road purpose. It has robust appeal. Over the years the car had many modifications to enhance its off road capabilities which are basic requirement of an SUV. The car offers a good control over it along with more power. It has diaphragm spring clutch to withstand high rotational speed which adds up to its strength. The soft top convertible design was converted to hard top to help the car sustain any environment. The car has an engine of 1298 cc and a great pick up. It has ground clearance of 210 mm. It has capacity of minimum 8 occupants. It is categorized as good performing car. Gypsy is deigned to survive in even the most extreme temperatures. The car is more successful because its ability to survive at the extreme temperatures. There are two variants of this car which offer 1 engine, 1 transmission and 1 fuel option. Maruti Suzuki Gypsy is a true off-roader comprising four-wheel-drive system that does not allow you to surrender yourself to the challenging roads. Based on the long wheelbase Suzuki Jimny series, this car is considered as a fully feature loaded machine. In the year 1985, this exclusive off- roader was introduced to the Indian market. In terms of styling, this car follows a true aggressive look and comprises sporty appointments. The large wheel-arches, anchored 15-inch alloy wheels with the tire specification as 205/70 R15 providing superior grip over the road surface. Its masculine front facade starts with round-shaped headlamps and conventional radiator grille that keeps the engine cool. Besides, it has got a spare wheel and large tail gate demonstrating its bold character. Exterior dimensions of this vehicle stand out to be 4010 mm x 1540 mm x 1875 mm (L X W X H) and the wheelbase is about 2375 mm. What to opt for:The rugged vehicle by Maruti Suzuki does not comprises exclusive exterior package, therefore for a relaxed driving experience the complete insurance of your vehicle will be a good option. The specially outlined Maruti Suzuki Gypsy ensures about the driver's and passengers comfort. Its fabric upholstery in hard-top and front seats with reclining and sliding functionality enable you to enjoy every turn of your drive. To store your amenities or essentials, this SUV is embedded with plenty of storage compartments such as large volume glove box, front package tray and many more. Also, the appointed seats are embedded with adjustable head restraints offering an extra comfortable ride to the occupants. What to opt for: The new Gypsy does not encloses advanced equipments and technologies, thus passenger coverages will serve the customer better. In addition, the Invoice Cover Insurance will also be a smart decision. Maruti Suzuki Gypsy is the true off-roader allowing you to face all the challenges of uncharted terrains with decent mechanics. Mahindra Thar, Force Gurkha, Mahindra Bolero are the strong competitors of this off-roader. When it comes to confidence and assured drive, the liable and collision coverages will help its buyers the most at the event of collision.